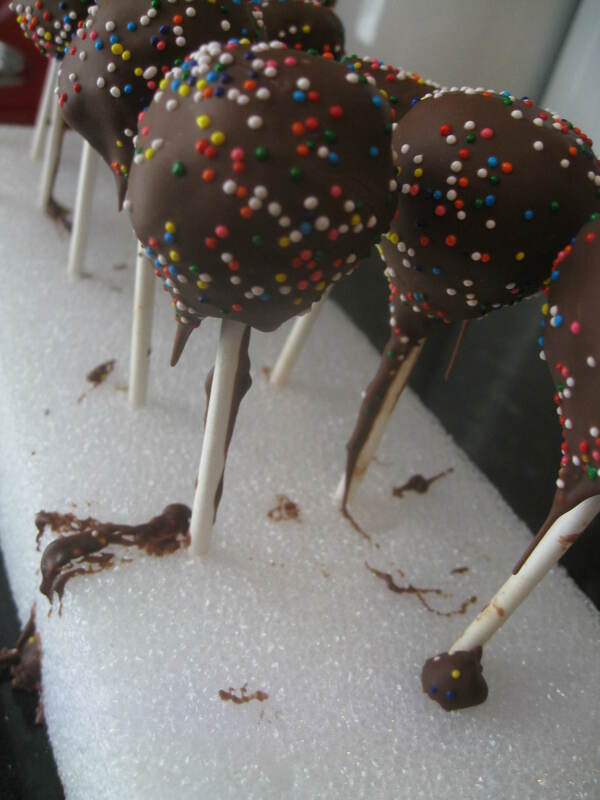 I was originally skeptical of this new dessert fad: cake pops. Who wants a ball of dried cake dipped in chocolate? When a friend sent me some for my birthday, I was forced to try them. As I bit in, I realized it was not at all what I expected. Instead of finding dry cake inside, I discovered the exact opposite. The cake was actually mixed with icing! 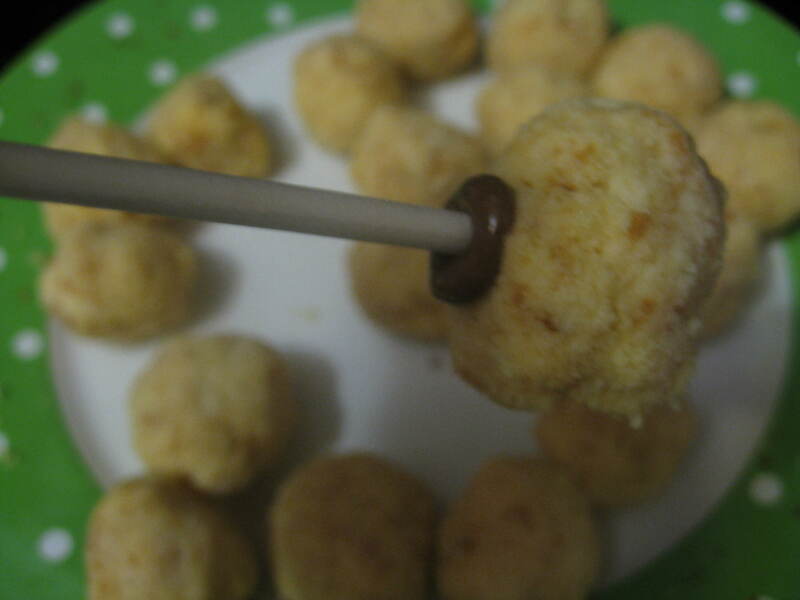 After having my first cake pop, I knew I wanted to make them. First step: get all of the supplies. This is the part that took awhile. I found the chocolate shell that you dip the cake into, but I kept forgetting (and when I didn’t forget, couldn’t find) the Popsicle sticks and Styrofoam. Last week, I finally went to Michaels and got the sticks and foam. I was ready to go. I split the process up into multiple days. The first day I made the cake. I just used a box of butter recipe golden cake mix because I had it on hand. After the cake had cooled, I put it in the fridge. The next night, I mixed the cake up with a few spoons of cream cheese icing from a container. I scooped the cake into balls with a mini-ice cream scoop and put them on a plate in the refrigerator. (I’m sure all of my culinary friends are turning their noses up at me for using a cake mix and pre-made icing, but I’m ok with that). 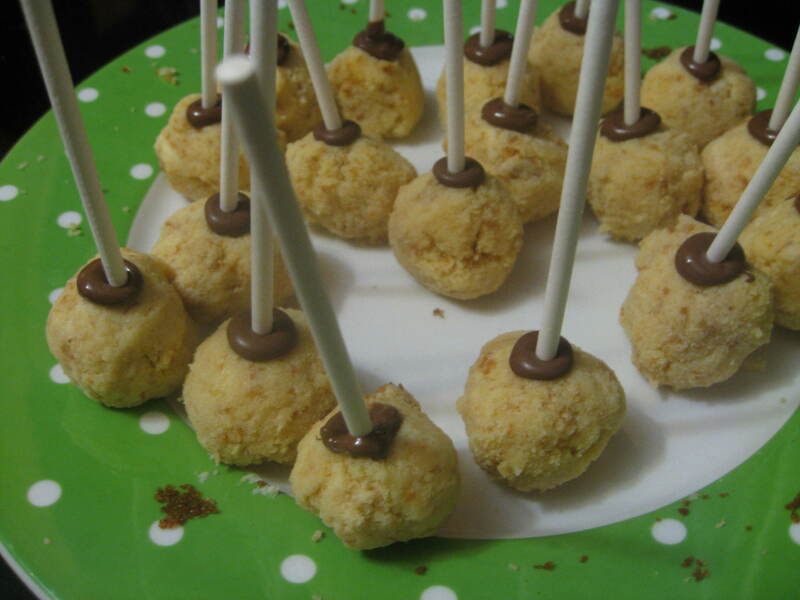 The third night, I first dipped the sticks into the chocolate and then into the cake pops (apparently it helps keep the sticks on). After leaving them in the fridge for an hour, I dipped the whole thing in chocolate and then poured on some sprinkles. 1. Make cake and cool. Store in fridge. 2. Mix cake with a few spoonfuls of cream cheese icing. 3. 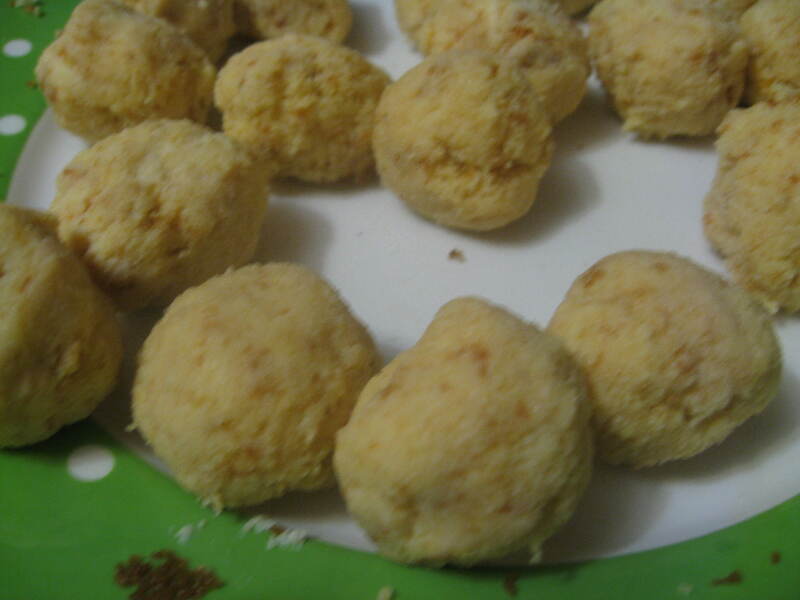 Spoon cake into small balls and put into the fridge. 4. 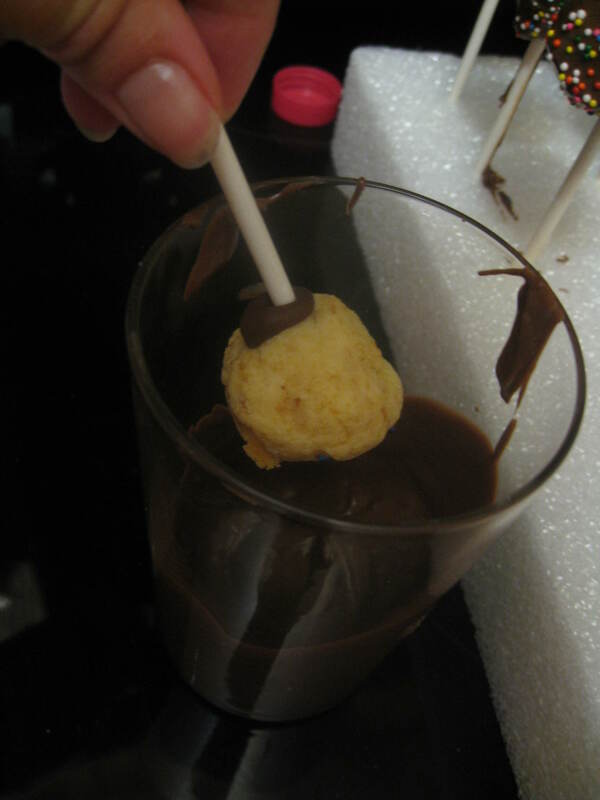 Melt some of the chocolate in microwave and dip the popsicle sticks into the chocolate and then into the cake pops. Put in the fridge for 1 hour. 5. 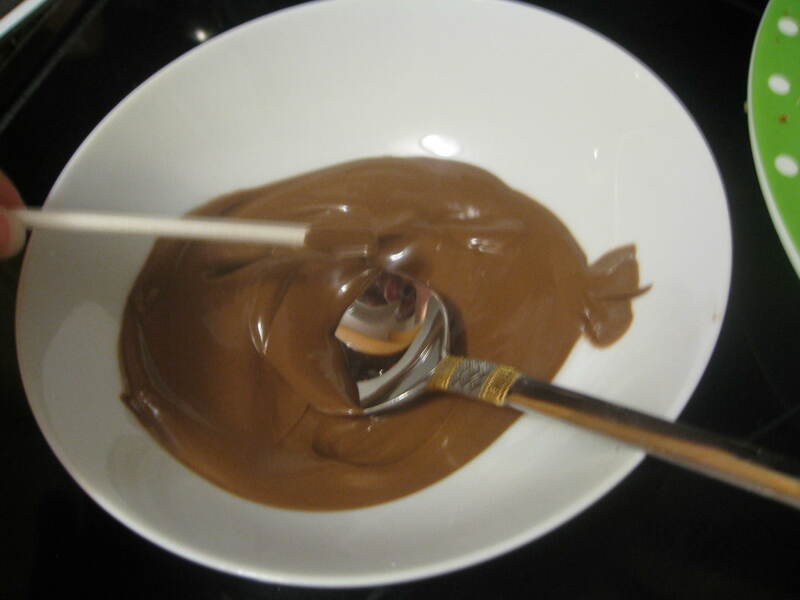 Melt the rest of the chocolate. 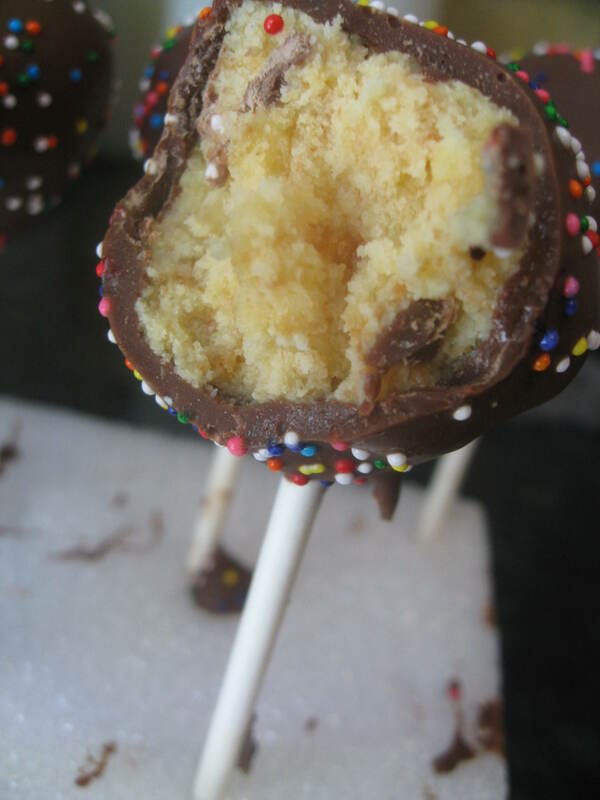 Dip the cake pops into the chocolate and add sprinkles. 6. Chill in fridge until ready to serve. Well done! No shame in the cake mix and pre-made icing…sometimes that just makes sense. I have plenty of “doctored up cake mix” recipes that are fantastic and no one would ever know the difference! They look so pretty. Nice work!